Sony's slinky Xperia Tablet Z to launch in Japan next week? 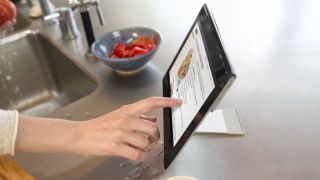 A Japanese network let slip some more details about the rumoured Sony Xperia Tablet Z, including the fact that it will launch in Japan on January 22. Although DoCoMo hastily took the offending info down, it didn't escape the notice of Android Authority who grabbed and translated the data. DoCoMo's site also revealed that it would be showcasing the tablet in-store until January 27; it's not clear if that means it will be a DoCoMo exclusive or if the wider release date will be January 27 or if the tablet will make it out of Japan anytime soon. Still nothing official from Sony itself, but we did see some specs leak on to the web yesterday. If these are to be believed, we're looking at another water- and dust-proof tablet from the Sony stable, with a 6.9mm-thin chassis (at its slimmest point, presumably) and a full-HD 10.1-inch display. It will likely launch running Android Jelly Bean. We'll be keeping a close eye on January 22 for hide or hair of the Xperia Tablet Z - meanwhile, amuse yourself with tales of the Sony Xperia Z smartphone equivalent that we got our hands on at CES 2013.